We have a very good reason for that. Product leaders like Martin Eriksson have been arguing against dates on roadmaps for years. As Martin has pointed out, product managers can’t do more than make an educated guess around when a project might be completed. After all, there are so many variables that you can’t factor into a long-term roadmap: team capacity, market changes, quarterly budgets and so on. So why bother communicating dates and deadlines on your product roadmap at all? So we made a pretty radical change: we ditched dates altogether. 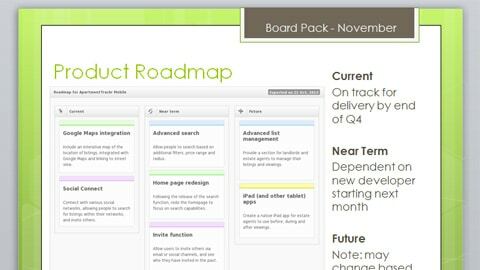 The original version of our roadmap was like a cross between a Gantt chart and an Excel spreadsheet. It was one of the first parts of ProdPad we built, until we realized that if we could design a much better roadmap if we ditched the dates. It would would give product managers a level of flexibility to focus on the bigger picture: product strategy and vision. After we worked through a version for some clients, we added the only structure you’ll find on our roadmap: three columns called Now, Next and Later. An original view of ProdPad’s roadmap. This brought us a lot closer to what product managers actually need: a tool to communicate their long-term product plans and strategy. We threw out deadlines and replaced them with broader time horizons that help you show off the ranking order of your priorities. Each card represents a theme (or “problem to be solved”) rather than a single granular idea, and cards get more and more defined as they move to from the right to left. This made strategy and priorities much clearer and easier to understand. We’ve gotten a lot of great feedback on this – we’ve purposely left it simple and non-prescriptive, yet clear enough to help you structure a long-term product direction around. It turns out that so much more is possible when you keep dates off your roadmap. It frees you up to think about the bigger picture. What kind of product do you want to build? Who should we build for? How steps should we take to meet those goals? My co-founder Janna Bastow gave an excellent talk on our approach to roadmapping at ProductTank. I highly recommend it! Thanks for the tips. Can you offer your template as a download? You can create the roadmap within ProdPad and export it as a PNG or PDF. Am I missing the point or is this just another “Kanban” ? Your discussion and example of roadmap without dates is interesting. I can definitely see how it provides “wiggle room” to make adjustments as various requirements (market, customer, etc.) change. How do you answer your sales team who is trying to forecast a pipeline of products when they ask for specific dates, packages and prices? What do the colours of your cards indicate? In the first screenshot the text is cut off. What’s the rest of it say? (May change based on…). Do you have suggestions as to how many cards to put on the board?